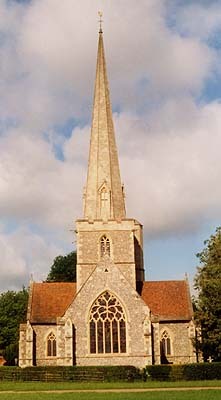 The Parish and Collegiate Church of Shottesbrooke must be the most idyllic in the county. It is a cruciform building entirely of the decorated period, erected by the Lord of the Manor, Sir William Trussell in 1337. The spire was said to have been based on that of Salisbury Cathedral and there is an old legend about the local brazier falling to his death from the top when it was completed. It once stood at the centre of an ecclesiastical college for attendant warden, five chaplains and two clerks. The little door, still to be seen, on the church's southern side once had a covered walkway connecting it to the chaplains' residence: two spacious halls with parlours and high chimneys. The church houses some wonderful medieval memorials: the founder's superb decorated tomb (did it once have wooden effigies? ), one of the college chaplains in his stone coffin and several fascinating brasses. Architecture: Decorated cruciform church with central spire. All of 1337. Monuments: Sir William & Lady Trussell mid-14th century decorated canopied niches; probably William Frith & John Bradwell 1386 Brass effigies; Lady Margaret Pembridge early 15th century Brass effigy; Richard Gyll 1511 Brass; William Throckmorton 1535 Effigy; Sarah Cherry 1714 Bust.